Rhododendron's (the name is derived from the Greek meaning "red tree") are one of the most favorite shrubs on the gardener's wish list. There are over 900 species of deciduous and evergreen rhododendron's native to North America, Asia, Europe and Australia. Rhododendrons are grown primarily for their colorful flowers. Sizes range from prostrate forms with pinhead leaves to tree-sized. Blooms may be the tradition pinks, purples and whites, but also include yellows and dark red varieties. Most bloom in the spring, but some varieties in mid summer and the fall. Azaleas are really rhododendrons. The main difference with some exceptions, which can be argued, is that azaleas tend to be deciduous with funnel shaped flowers and rhododendrons tend to be evergreen and bell-shaped flowers. 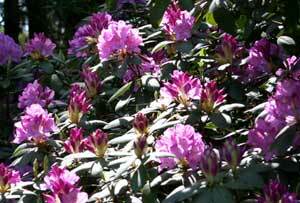 ALL rhododendrons need excellent drainage and an acidic soil rich in organic matter. They do not tolerate hot, dry or windy conditions. Any combination of these intolerance's can prove fatal for rhododendrons. They can be grown in heavy soils if special precautions are taken. Soils high in organic matter or humus such as decayed oak leaves, pine needles or other acid-type compost is desirable for growing rhododendrons and azaleas. Beware of most peat moss available today. Much of it is of poor quality; often it is very fine and holds too much water for good soil aeration. Also, it's not suitable for mixing with heavy clay soils. 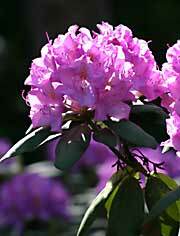 In hot or alkaline soil areas rhododendrons are frequently grown in straight pine bark with little or no soil added. Care should be used in obtaining a fine grade or small particle pine bark. 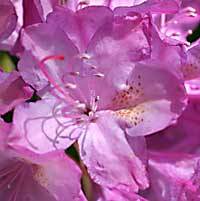 Rhododendrons and azaleas, in general, require an acid soil with pH about 5.5. Soils with pH higher than 5.5 should be acidified. Dappled shade is best, but many rhododendrons will grow in full sun given moderate temperatures and adequate moisture throughout the growing season. Make the planting hole shallow. 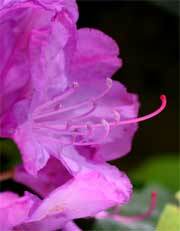 Rhododendrons and azaleas are easily damaged or killed by planting too deep. 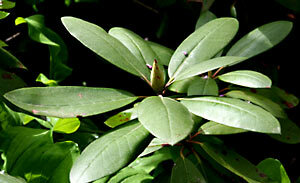 Rhododendrons have fine, surface feeding roots in their natural environment. This will be what you should try to duplicate. After planting, mulch with pine needles or leaf mold rather than cultivating near the base. Rhododendrons should be planted with either a root ball, for field grown plants, or with their container mix, if container grown. 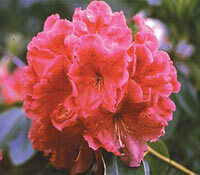 In ideal climates, rhododendrons can be planted at any time plants are available for purchase with reasonable success. In colder areas, early spring planting is recommended with early fall planting being second choice. In hot areas, fall planting is preferred. Also in hot climates, root rot organisms flourish in wet soils and can kill rhododendrons quickly. Raised planting beds that incorporate 50% or more fine pine bark can be helpful in suppressing Phytophthora root rot. Extreme cases may require the use of fungicides such as Subdue or Aliette. Can be used as specimen plants, used as hedging or to brighten dark spots sometimes found in the garden. Can be used in mixed gardens with other acid loving plants. Pruning is rarely necessary except to renew neglected plants. Spent flowers should be pinched off to prevent seed formation. 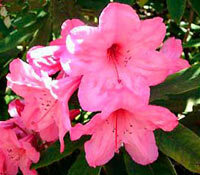 Begin your rhododendron gardening with hybrid or species rhododendrons and azaleas recommended for your area. The chapter of the American Rhododendron Society nearest you can supply guidance in selecting the most suitable varieties. Purchase plants from local nurseries or garden centers or reputable mail order firms. Sometimes unsuitable varieties for your area will be found at local discount stores or garden centers— take care in selecting your varieties. Rhododendron plants at nurseries are available as small plants without buds or as larger plants with buds already formed. Evergreen azalea plants usually have flower buds even if the plants are very small.